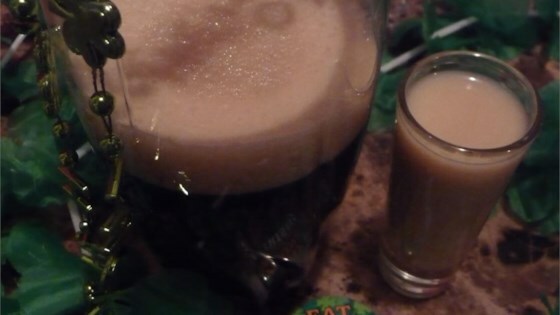 "This classic St. Patrick's Day drink is simply a shot glass filled with Irish cream and Irish whiskey, dropped into a glass of stout beer. The combination of the three will knock you off your feet!" Pour beer into a pint glass. Pour Irish cream and Irish whiskey into a shot glass. Gently drop the shot glass into the glass of beer. See how to make a stout beer, Irish whiskey, and Bailey’s Irish Cream cocktail. An important missing piece to this recipe is that you need to drink the whole thing immediately, because the Bailey's will curdle from the whiskey. This is a St. Patrick's Day (well, any day for that matter) tradition in my family!! !